True taste is an absolute value. As such, it can relate to anyone: the challenge is in distilling it, exporting it and ensuring that the whole world learns to recognize it. I have always dreamed that one day I might captivate guests by serving them superb spaghetti with tomato sauce thousands of miles from home. I believe our country’s finest flavours know no bounds or national boundaries: after all, there are none in the case of Italy’s most exquisite species of beauty, craftsmanship and lifestyle. The idea of creating my own, uncompromising code of great contemporary Italian cooking fascinates me; the chance to see it reach far and wide intrigues me. When Bulgari suggested I create the cuisine of Il Ristorante at the new Bulgari Hotels in Beijing, Dubai and Shanghai, I realized this was an opportunity to bring my philosophy of simplicity to bear on the world of luxury. An elegant, joyful cuisine that would express an unconditional, “total” taste to reflect our culture and spirit in their entirety. My restaurant in Abruzzi is called Reale, perched on a mountain slope at some 3,300 feet, 1,000 meters: a former monastery dating back to the 1500s. Abruzzi is a region in central Italy, wedged between the Adriatic Sea and the Apennines, steeped in pristine silence and natural beauty. Its roots go deep, speak of an ancient heritage in soft yet powerful accents. Nothing is ever “over the top” hereabouts, every detail compelling, from the saffron landscapes blanketed with purple crocus, to the buttressed medieval villages. When my sister Cristiana and I inherited the restaurant, I knew nothing at all about the business. This prompted me to tackle the job based on two key principles: hard work and few frills. I dislike anything superfluous or convoluted: my ideal of beauty, basically, is a dry-stone wall. What I look for in a particular dish is tastiness, balance and distinctiveness: by “distinctiveness,” I mean that my dishes come across in a straightforward manner, they do not need to be interpreted or spelled out obsessively. I aim for clear-cut, light fare, where flavour builds up then explodes, catching some of our guests unprepared – notably those that come to us expecting a firework display. I have done a lot of research prior to reaching this culinary credo, experimenting with techniques, materials and flavours. I see my work as a chef as somewhat like a tailor’s, who manages to render the stitching so imperceptible it does not spoil the fabric’s smoothness, or a watchmaker’s, who can conceal the complex inner workings of a watch in the slimmest of cases. In the space of few years, I have developed a diversified system in my monastery, which is called Casadonna. It comprises a professional cooking academy equipped with large workshops for the R&D into new concepts and recipes. I enjoy training and gastronomy education and, together with my team, have also created a street food chain (Bomba), a casual dining format staffed by graduates of my school (Spazio), and a gastronomic-scientific protocol (Intelligenza Nutrizionale, “Nutritional Intelligence”) for application to mass catering, hospitals, schools, canteens. All these projects are connected, and the Reale restaurant is like the hub of a great wheel: that’s where we develop the techniques, which are then relayed and adjusted to the other departments. I like this pattern that goes from top to bottom, outwards from the centre, reaching a larger and larger public. A little like design, which responds to commonplace needs by designing objects that are as pleasing as they are functional and replicable. The Casadonna system is a continuous, self-sustainable flow where a project that blossoms in one of the outer sections generates ideas that flow back inwards and take root at the Reale restaurant. Bulgari believes in the strength of this system and in its profound Italian identity. 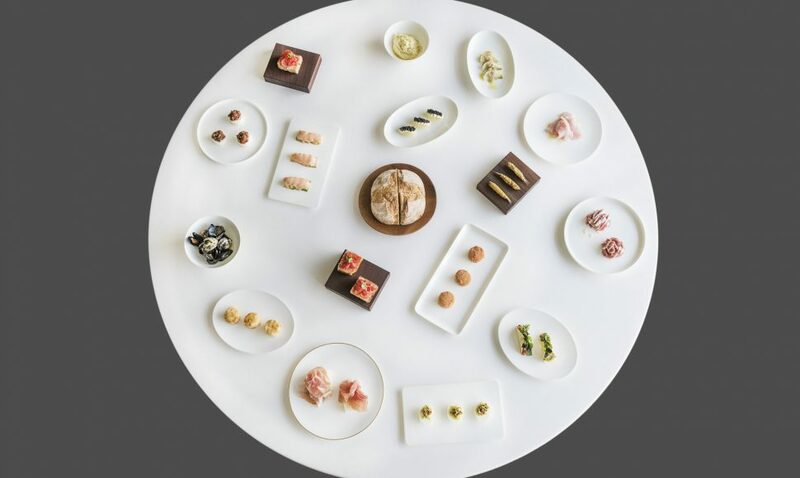 Nonetheless, I envision a distinct approach for the new Bulgari Hotels, a cuisine that is neither Reale’s nor Spazio’s: I wanted an unprecedented concept. That is how we came to orchestrate a canon of great Italian classics – an anthology of not only ingredients or recipes, but style of presentation and service, revisited in a way that’s meant to be necessary and concise. What’s more, standards that can be flawlessly replicated anywhere, from China to the Middle East. The purest of consommés to start with; a generous, Italian-style antipasto to share; bucatini just as they should be, our ideal of fresh and stuffed pasta; braised meat, roast, mixed fry one can never have enough of; a hefty breaded cutlet, fish soup. The dessert trolley, a loaf of bread, right out of the oven and piping hot in the middle of the table, a drizzle of extra virgin olive oil over pulse soup. Ossobuco with saffron, monkfish with white truffles, “pasta spezzata” [a pasta medley] with balsamic vinegar, ragout with shellfish. Perfectly humble ingredients, ennobled by technique. Sophisticated ingredients, further fine-tuned by the touch of simplicity. The starting point consists of Italian traditional recipes; the end point is meant to be a philologically punctual yet updated reinterpretation of our heritage, one that is streamlined and essential. The kind of cuisine I’d like to eat when I’m away from home, my “ideal” of Italian cooking. At Casadonna we make our own bread and prosciutto, wine and fresh pasta; we roast, we char-grill, we steam, we use low-temperature cooking, extract and ferment. I have set up a distinct workshop there, exclusively devoted to developing the new Bulgari Hotels’ Il Ristorante Niko Romito menu, and in 2016, got together with the chefs that collaborate on the project with me in this particular workshop. We consulted our notebooks and began to research and experiment, ultimately reaching a core of dishes and gastronomic concepts that, to my mind, incarnate the essence of fine Italian food. Once we identified these, we reproduced them by applying the techniques and principles that have always characterized my method, aiming for a paradigmatic ingredient by streamlining, working on structures, enhancing flavours, balance and pleasantness. We had fun putting together our Italian-style antipasto, Antipasto all’italiana, imagining it as a gastronomic grand tour: it’s meant to share, since the way food is experienced and served is part and parcel of this journey of ours. We naturally began with tomato bruschetta, a sliver of Parmigiano and a selection of our finest cold cuts. Next is vitello tonnato, veal with tuna sauce, roast caciocavallo cheese, cut into wedges, such as you find in my region and a good portion of central and southern Italy, and a seafood sauté. We thought of Piedmont and added bagna cauda, the traditional hot dip with anchovies and vegetables; we thought of Roman street food and included supplì, the fried rice ball with tomato. We incorporated frittata di pasta or pasta omelette: we prepare that with bucatini, smoked provola cheese and a béchamel where we’ve replaced butter with rice starch. In time, when the season is right, we’ll have crisply fried, battered zucchini flowers. Another antipasto that is emblematic of the new menu concept is our scampi cocktail, Cocktail di scampi. A classic of hotel restaurants that years of serial production have made into an obsolete cliché. We have reinterpreted it this way: we steam the scampi and serve them with a cocktail sauce of our own, made of fat-free mayonnaise and our version of ketchup. We prepare the mayonnaise by replacing the eggs with a “scampi base,” i.e. an extract from scampi heads, rich in a thickener similar to albumin; we then add a “tomato base” with vinegar (at the Reale restaurant, we use “bases” a lot, supple pastes extracted from pure ingredients, as well as pistachio). The finishing touch to our scampi cocktail is marinated lettuce. 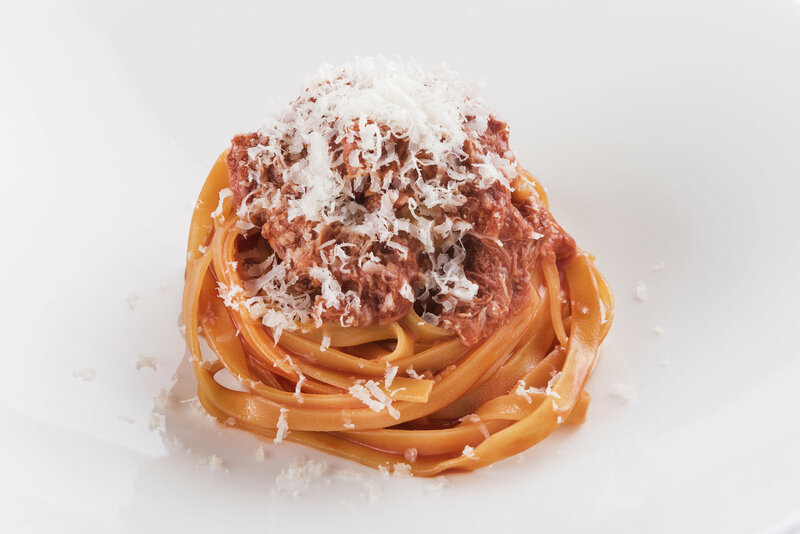 One of the first courses in our menu is Tagliatella al ragù delle tre carni, tagliatelle pasta with three-meat ragout. We start out with beef, pork and lamb, using the shoulder, which is richer in connective tissue and ensures a good degree of moistness. We blanch the meat not by traditional boiling but by steaming it (110° C, 230° F, for 20 minutes), so as to mellow the flavour of its fat portion without weakening overall tastiness. We cut it up into large pieces (which lose less fluids as they cook) and place these into the pot with tomato preserve, celery, carrots and onions, on low heat, subsequently adding salt, thyme, sage, bay leaves and rosemary. We separate the tougher portions by hand and what we have is a creamy ragout we use to dress our tagliatelle. We add no fats, not even olive oil: not because we want to be dogmatic but because in this case there is no need to, the flavour is intense as it is. We offer several types of stuffed fresh pasta, like Ricotta and spinach ravioli in tomato water. Not forgetting our impassioned pursuit of dried pasta dishes, where we have salvaged several formats that have fallen into neglect. Hence our versions of Spaghetti with olive oil, garlic and chilli pepper, Bucatini alla puttanesca with pecorino cheese, Spaghetti with spring onion and balsamic vinegar, Pasta spezzata with octopus and potatoes and Risone with mullet, which is a dried pasta shaped like a melon seed that we prepare like a risotto, only without butter, using a kind of mullet broth we extract by pressure. Also on the menu are our Tortellini in brodo, tortellini with broth, “the” Lasagna with meat ragout, and Cazzarielli, turnip greens and chickpeas, a fresh pasta with no egg typical of my area, humble in origin yet rendered elegant, in this case, by the fish sauce. 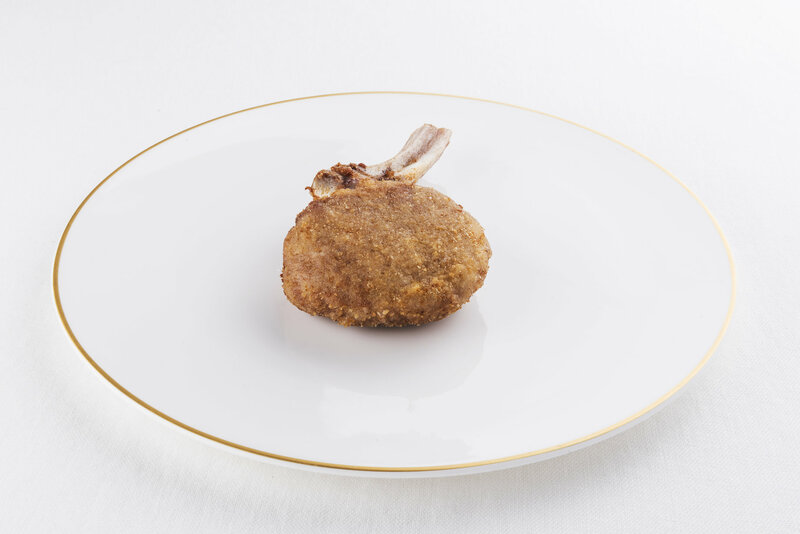 What a lot of hard work went into the Cotoletta di vitello alla milanese, the Milanese-style, breaded veal cutlet that has always presented two critical issues, in my way of thinking: separation of the bread coating and uneven cooking. Here’s the procedure: we start from the cut, a 2-cm high (0.8 inches) bone-in loin. The cutlets are first cooked at a controlled temperature, to stabilize the juices. When the client makes his order, they are toasted on extremely high heat for few seconds, then brushed with a solution of water and cornstarch and subsequently breaded with breadcrumbs we prepare ourselves, with a precise grain size that needs to be the same, every time. Finally, we fry them in clarified butter. The result is crisp on the outside and moist inside, with a rosy hue and uniform texture (due to the temperature-controlled cooking stage). In this manner, the bread coating does not separate from the meat. Tuna, white beans and onions “in carpione” (marinated in vinegar, wine and sage leaves) is the noble version of a popular product to be found in every Italian household: tuna in olive oil. In tackling this particular fish, we chose not to prepare the classic, pan-seared fillet, golden on the outside, pink in the middle. Instead, we went for a creamy consistency and pale hue, rather like quality tuna fillets’ in the classic glass jar or can (tuna belly in particular). We chose to work with the tuna belly, steamed it (the traditional version is boiling it prior to preserving it), then dressed it with extra virgin olive oil, white beans, marinated onions, wild fennel and diced fresh tomatoes. We serve it with just a few drops of elderberry vinegar. A dish I’m particularly fond of is Roasted monkfish with cacciatora sauce. In this case, too, we steam the fish, then pan-sear it and add a top coating consisting of a sauce made of olive oil, garlic, rosemary, chilli pepper, white wine and vinegar. This is what we call a gravy or “sughetto,” something we thrashed out at length as we were fine-tuning the menu of Bulgari Il Ristorante Niko Romito. Cacciatora, puttanesca, carpione, scapece, pizzaiola, putacchio, reduction sauces from olive oil, a variety of herbs, olives, capers, tomatoes, stock, wine, vinegar and other traditional Italian ingredients: these are mixed with the juices released from the meats and fish as they cook, and enhance them – a stratification of sorts (another key concept in my cuisine). French reduction sauces are delightful but are not part of our heritage; these dressings, on the other hand, are quintessentially Italian. Just as Italian are the side dishes: many of our second courses are conceived to be paired with a vegetable (such as Salted codfish, potato purée, bell peppers and vegetables); others (like Stewed pork with milk) come with a choice of three typical side dishes like pan-tossed chicory, grilled Trevisana salad, roast potatoes, sweet-and-sour spring onions. We have reflected at length on the finishing touches when serving, the little details like freshly grated Parmigiano (a timeless, familiar gesture of great restaurants of a Sunday), the drizzle of extra virgin olive oil over minestrone or few drops of balsamic vinegar. As for desserts, it will be possible to savour a slice of panettone throughout the year, garnished with Marsala zabaglione, freshly beaten at the guest’s table in the traditional bastardella copper pot. Another tradition resumed is the dessert trolley, with a rotation of classic sliced cakes (apple pie, custard cake with pine nuts, the Neapolitan pastiera and babà cake), the Piedmontese bonet, panna cotta or crème caramel, yet another forgotten treasure. There is obviously also a dessert list featuring such items as our own, light yet scrumptious version of Tiramisù. As a tribute to my father’s speciality, we have a fried Bomba with pears, dark chocolate and water. Not forgetting ice cream: few flavours, cream-based or fruit-based, served with little silver trowels and cups – the modernity of the Seventies. Those who know me well may wonder: “what about bread?” Bread is deeply rooted in our food culture, exquisitely simple yet difficult to get just right. It’s the cornerstone of my philosophy, in a way: my Reale restaurant features a vast workshop specifically devoted to bread-making, and I serve it as an entrée of its own in our tasting menu. I’ve been researching it for years and will never cease making it. Bread is in the spotlight at Bulgari Il Ristorante Niko Romito, too: we make use of extremely lengthy fermentations, in order to maximize flavour, structure and digestibility, and employ select flours, chosen for their organoleptic and nutritional properties. We present the bread loaf, whole, in the middle of the table, like a totem that anchors us, a flag, signalling this is stripped-down basics territory, home of what is truly essential. We also serve fine Italian breadsticks, focaccia and crunchy puff pastry. That’s it: the cooking narrative needs nothing more. This is luxury as we see it. Identifying the menu was our first objective. The second was making them replicable, so as to guarantee the same quality level, the same language, and an equally strong and exclusive experience in any location, regardless of geography and its limits. Together with the Bulgari team, I have created a protocol, listing set ingredients, weights, temperatures, times and MOs that would need to be meticulously applied in every kitchen. The menus, save few exceptions (for instance, in case of religious-based constraints with regard to food), will be identical everywhere. We have yielded to no compromise in order to adapt to a given context. Spaghetti is supposed to be eaten in just this way, tomato’s acidity is such and such. This doesn’t mean we’re going to be impermeable to influence. Let me give you an example: I can’t wait to study Chinese techniques for cooking broth, which to my mind, is one of the cornerstones in a menu. We use Italian ingredients. Where importing them is not possible, we work with the finest local producers. I need not reiterate that we shall be using the best raw material and will treat it with the utmost respect, as at this point, we consider such details a given. Pleasantness remains central: taste and aesthetics are essential, and the former triggers the latter, since an ingredient that’s been enhanced is necessarily “beautiful”. These dishes are also appealing to look at, partly due to their precious ingredients, partly because our approach to transforming them preserves textures and highlights colour and transparencies, while our approach to presentation is characterized by balance. Our dishware is white, not large, glossy, classic: the food is its only ornament. A thin gold line is solely used for consommé cups, cutlet dishes and roast, fermented Savoy cabbage dishes. At Bulgari Il Ristorante Niko Romito, one may order à la carte or select a tasting menu. The latter comes in two versions, a more traditional and a more sophisticated menu. Restaurant staff is ready to illustrate the dishes, though discreetly, going more in depth only with guests who wish to know more about the ingredients and history of the recipes. Apart from such cases, we let the food do the talking. And what the food speaks of is culture and pleasure, substance and elegance. The sole way to have people discover our food lifestyle is getting them to try it. Only thus will customers located thousands of miles from this country be able to acquire their own code of Italian taste, be able to recognize it, make comparisons, expect the genuine thing when eating out and ordering, say, spaghetti with tomato sauce. I truly believe some flavours can be “recognized,” even if one tastes them for the very first time. Naturally, food is a total experience that goes well beyond what’s in one’s plate. It’s a question of atmosphere, care, even sophistication, and above all, well-being. One of the keys to the best Italian hospitality is just that: putting guests at their ease without apparent effort, without letting on how it’s managed. It’s a number of factors and nuances as indefinable and irresistible as the idea of an Italian identity, italianità. Bulgari does this style of hospitality especially well: welcoming guests into a world of relaxed, natural, unforced luxury – as when a guest walks into an extremely elegant restaurant yet may choose to dine at the counter. Clients who enter the Bulgari Hotel and eat at Il Ristorante Niko Romito, whether in China, Dubai or anywhere else in the world, will walk out feeling they have been to Italy, even if they’ve never set foot on Italian soil. Would you like to be notified anytime a new post is published?